I am happy to say that in May it will have been two years since I stopped eating meat. It’s truly been one of the best decisions I made for myself and I can honestly say that I don’t believe I will go back to eating meat. Before I became a vegetarian (I’m not vegan and I’m not sure whether or not I will eventually go that route) I would go through phases of cutting out meat before declaring it to be too difficult, giving up and stuffing my face with some sort of underwhelming meat-filled sandwich. After watching Earthlings it all clicked for me (if you want to weep for humanity, watch that documentary) and I decided that I was going to figure out how to do this right. In the last couple of years I have realized that eating a plant-based diet is actually super easy, delicious, healthy and, wait for it, CHEAPER. People always complain that being a veggie is so expensive, but if you skip some of the gimmicky vegetarian foods and do it right, it’s actually more affordable than eating meat! Don’t believe me? Read on. Frozen is not a dirty word and buying several bags of frozen vegetables is not only way cheaper than buying all of the individual components of the bag’s contents fresh, they are also nutritionally just as healthy, if not more so, because they are picked and harvested at their optimal time (unlike other produce which is often picked when it is still unripe and left to ripen artificially). Frozen veggies are a staple on my grocery list and I use them to make stir-fries, curries, roasted vegetables, taco bowls – you name it. Scoop up a few bags on your next grocery trip and I promise you will be amazed at how versatile they are and how fresh the veggies taste. Sure, if your name is Gisele Bündchen or Miranda Kerr then you can afford to make sure that everything in your fridge was grown completely organically, watered with unicorn tears and harvested on a new moon at peak ripeness for optimum nutrition. If not, don’t worry, not everything you eat needs to be organic to be healthy. There are certain foods (the dirty dozen), like strawberries, tomatoes and apples, that you should try and buy organic. But you don’t need to exclusively buy your produce from the organic section of the store. There are lots of vegetables and fruit – like avocados, asparagus, onions and cauliflower – that are considered to be clean. The cost of buying organic does quickly add up and if you’re going to shell out, make sure it’s worth it. Sometimes a good wash is all your veggies and fruit need. Before switching to a vegetarian diet, I always thought the bulk food section of the grocery store was overwhelming. Those big containers filled with beans, nuts and lentils just seemed to not correlate with food to me (they looked more like what you would use as filling for sandbags or pillows). The thing is, you can make a million dishes with beans, nuts and lentils and you can buy bags of them without breaking over $10-$15. Try it and be amazing at how long it will be before you have to grocery shop (although you might want to anyways because you’ll be inspired by all the creative vegetarian dishes you can make). Honestly, one of the best parts about eating vegetarian is that it forced me to expand my cooking skills. My family are all omnivores and my boyfriend loves nothing more than a plate of ribs so I knew I couldn’t rely on there being vegetarian food available in the house. My need to cook led me to love cooking and become passionate about vegetarian food! While at first daunting, I have since discovered that the world of vegetarian cuisine is diverse, delicious and so creative. I’ve learned that meat is so not necessary for a meal to be filling and tasty, lots of veggies can stand in for meat (mushrooms, artichokes, eggplant, jackfruit, etc. ), and the simpler your meals, the better. You don’t need to go ham with your meals (pun obviously intended). For example, one of my favourite dishes is a marinated tofu bowl. Tofu, sticky rice, carrot, cucumber, seaweed and avocado. Boom. So good and so healthy. Keeping it simple also helps you ensure that your groceries last you longer which saves you money in the long run. A few of my favourite vegetarian meals. Here’s another aisle I never visited before becoming a herbivore! Allow me to let you in on a little secret. You can find almost every vegetable in a can and they only cost a couple of bucks. Tomatoes? Check. Potatoes? Yup. Corn, artichokes, olives, beans, lentils, beets, carrots, peas, bamboo shoots, water chestnuts and mushrooms? Oh, yeah. You can stock up on an armload of inexpensive vegetables that are full of nutrients and last longer than fresh produce. Wins all around. There’s nothing more reassuring than meeting the people who are growing your food. The people who have planted the seeds, watered the roots and nurtured the soil to ensure that the food you’re buying is top quality and optimally nutritious. Farmer’s markets are a great way to find new vegetables, fruits and spices you’ve never tried before, all the while conversing with those who are the most knowledgeable about produce. Prices are usually reasonable and you also get the satisfaction of knowing you are supporting local farmers. It’s really a fun experience shopping at the farmer’s market! I hope you find these tips to be helpful! Are any of you transitioning to a more plant-based diet? How are you finding it? Let’s talk veggie stuff in the comments! As a student, there are times when I have to cut my grocery bill way, way down in order to afford life. When I can’t afford to splurge on the more exotic items I want (hello Coconut Bliss Naked Coconut Ice Cream and bubbly wine), I have a couple of go-to recipes that I turn to throughout the week to make sure that I’m not, quite literally, eating through my money. One delightful perk of my new-found vegetarianism is how cheap my meals can be if I just focus on whole foods. When you’re buying nothing but fresh produce and canned lentils, you can watch your grocery bills go from $60+ to quite often less than $30 in the blink of an eye. Still, no one wants to eat nothing but plain, raw veggies all day, so a little creativity is needed to transform them into delicious and nutritious meals that will leave you totally full for hours, while still craving seconds because it’s just that tasty. This particular recipe is chock full of satiating protein which will leave you satisfied until your next meal – without the bloat that comes from gulping down a steak. It’s also delicious, free of refined carbs and can be whipped up in 20 minutes. Read on to find out how to make this plant-based plate of heaven. 1 // Wash and peel the carrot and zucchini. Use a spiralizer (follow the directions depending on which model you have) to cut both vegetables into long, noodle-like strands. Set aside. 2 // Grease a skillet with a little bit of coconut or olive oil and add the vegetable ‘noodles’. Cook on medium heat. 3 // Rinse your beans or lentils and add them to your noodles along with all of your chosen spices. The spices I have listed here are my favorite, but feel free to get creative with flavours of your choice – for example, curry, turmeric, cayenne etc. Toss the ingredients and turn the heat slightly down. 4 // Add the diced tomato, tofu and tempeh to the stir-fry, along with the soya sauce and sesame oil. Stir all of the ingredients together. 5 // At this point there will be a lot of liquid in your stir-fry because all of the moisture will be cooking out of the vegetable noodles and tomato. One way to thicken it up is to add a bit of peanut butter (or any nut butter). This will also give the dish extra protein and enhance the Asian-inspired flavours. It’s totally optional but I really enjoy the creamy consistency and rich, nutty flavour it gives the stir-fry. 6 // Continue to simmer the mixture on low-heat until all of the extra juices have been reduced. Feel free to add some vegan cheese for a little extra flavour and creaminess! 7 // Serve on its own or with some brown rice or quinoa for even more bite and protein. This dish is extremely filling (contrary to the popular belief that vegetarian and vegan meals leave you feeling hungry) and this recipe makes enough for two or three portions. Again, this recipe is totally customizable depending on your tastes. Swap out the spices and vegetables for your favorites. Don’t like carrots? Spiralize sweet potato or parsnips instead! Not a fan of tofu? Add some seitan and cut up portobello mushrooms! I have really enjoyed cooking vegetarian meals and I find that because they do not have meat, the extra effort and creativity that goes into creating these dishes makes them even more delicious then some of the carnivorous meals I enjoyed in the past. It’s also nice not feeling bloated or lethargic after every meal! Even if you don’t consider yourself to be a vegetarian or vegan, keeping at least some of your meals completely plant-based throughout the week will have a powerfully positive effect on your health – as well as your cooking prowess! Give this recipe a try and let me know what you think! Also, as always, I’m always snooping around for new veggie recipes, so please give me a shout my herbivore friends! When I’m in a pinch for time or simply want a super healthy meal on the go, green smoothies are one of my favorite breakfast options. They are packed with vitamins and can be made in minutes with minimal clean-up afterwards. Packed with chlorophyll and other essential plant-based nutrients, green smoothies have been praised for their many health and beauty benefits, such as glowing skin, shinier hair, a stronger immune system, and a decreased risk of heart disease. They are also a great way to sneak in extra greens without you even noticing them (kids love them)! There are a lot of great recipes out there that I enjoy, but this is my favorite green smoothie recipe of all time. Chock-full of healthy fats, vitamins, and antioxidants, this rich and creamy smoothie tastes like dessert but packs a serious nutritional punch. Plus it’s vegan! 1 // Add all of the fresh fruit and avocado into the blender and add one cup of almond milk. Blend on high until the mixture is smooth and creamy. 2 // Toss in the leafy greens and frozen fruit along with the almond milk, spirulina, and matcha powder. Blend on high until the smoothie is entirely mixed and has a frosty yet creamy consistency. 3 // If you prefer your smoothie to be sweeter, add a drizzle or honey or real maple syrup and blend on low to mix it in. 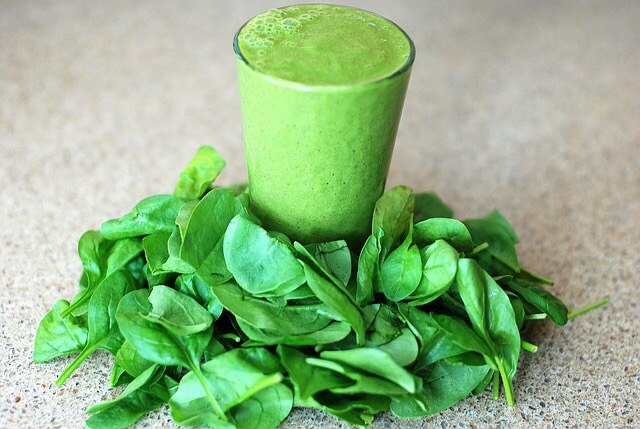 4 // Enjoy your delicious and super healthy green smoothie! Have you tried green smoothies and, if so, are you a fan? If you give this recipe a try, let me know how you felt about it! It’s my fave but I’m curious about what others would think. Until next time! There are few things I love more than breakfast and I especially love pancakes. The lazy Saturday mornings I spend making chocolate chip pancakes with my boyfriend are something I really look forward to and cherish. That being said, lately I’ve decided to put more effort into my health and eating right. I’ve also started eating a vegetarian diet. Although I am not vegan and do eat dairy and eggs, I try to keep portions of those foods small and so I really love the idea of making dishes vegan whenever I can. This pancake recipe came from a friend and colleague and is as delicious as it is nutritious. 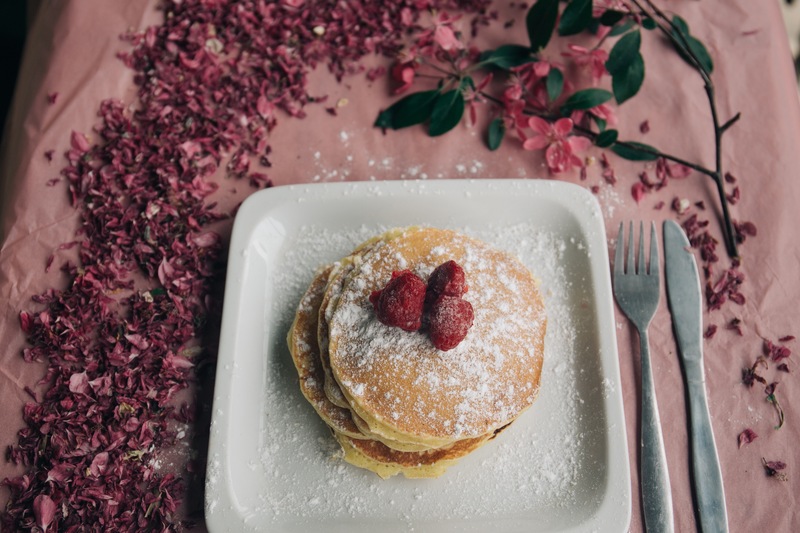 It leaves out all of the things that could conceivably make pancakes unhealthy (refined sugar, dairy, white flour, eggs) but keeps the flavor and fluffy texture of the pancakes you’ve grown up eating. It’s also filled with energizing vitamins so you won’t feel sluggish after eating these like you would with a stack of flour-made pancakes! They are incredibly quick and easy to make – all you need is a blender and a mere handful of ingredients. Here’s how it’s done! 1 // Preheat a pan or skillet on medium heat. Grease the pan with a bit of coconut oil. 2 // Measure out the ingredients and dump them into your blender or food processor. 3 // Blend on a low speed until the ingredients are blended and have a consistency that resembles batter. If the consistency is too thick, add a little bit of coconut or almond milk. 4 // Use a soup ladle or 1/2 cup to scoop up the batter and pour it onto the hot pan. 5 // Cook the one side until small bubbles start to form. Flip the pancake and cook the other side (approximately 2 minutes). 6 // Repeat until all of the batter is used up. Garnish with fresh fruit, whipped coconut cream, and a touch of syrup! If you give these a try let me know how they turned out for you! Also, I’m on the look out for other good vegetarian or vegan recipes so if you have a great one, please share! For a long time I have wanted to adopt a vegetarian diet and I have finally decided to take a leap and just do it. I know that there are going to be challenges ahead of me – mainly battling temptation while eating with my family and boyfriend, all of whom love meat and think I’m a bit of lunatic for trying to give it up again. Maybe now that I have put this out into the webosphere I will feel like I’m held even more accountable for my eating habits. 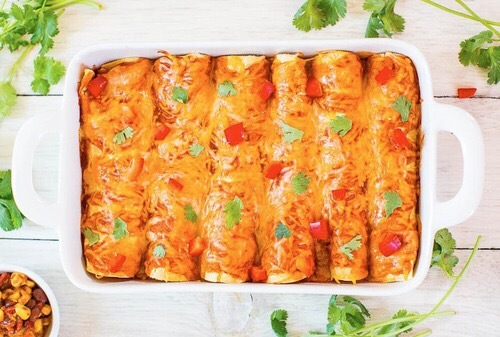 I’m super stoked to try more vegetarian dishes and I decided to try and replicate one of my favorite meals – enchiladas – without using any meat. I made this for my boyfriend the other day and he said that he couldn’t even tell that it was meatless. It was flavourful and filling, and a lot lighter in calories than the enchiladas I used to make. It was also super easy! Whether or not you are a vegetarian, I am pretty confident that you will enjoy this dish! 1. Preheat the oven to 350 degrees (Celsius). 2. Chop the onion into small cubes and sautée with olive oil and the veggie ground. Add the garlic powder, salt, pepper, and chili powder. Sautée for 10 minutes or until the onions are translucent. 3. Grease a baking dish with a bit of olive oil (or coconut oil) and lay out tortillas. 4. Pour enchilada sauce into a bowl (I used pre-made sauce) and scoop a spoonful onto a tortilla and spread the sauce from edge to edge, covering the tortilla. Scoop a couple of spoonfuls of the veggie mixture into the tortilla and sprinkle cheese on top. Roll the wrap and place into the baking dish. Repeat this and line up the enchiladas until all of the mixture is used up. 5. Pour the remaining enchilada sauce on top of the enchiladas and spread it as evenly as possible across. 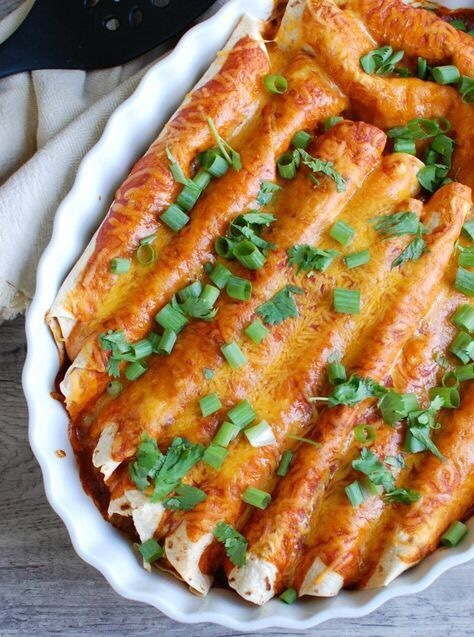 Finally, sprinkle the rest of the cheese on top of the enchiladas. 6. Bake for 15 minutes. Serve with salsa, sour cream, cilantro and guacamole. Enjoy! If you try this recipe, let me know what you think! Also, if anyone has any vegetarian recipes you think I should try, let me know in the comments!